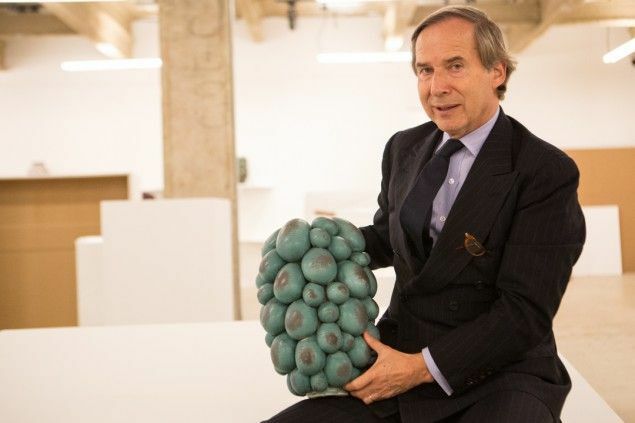 Simon de Pury at Venus Over Manhattan. Among the many talents of Simon de Pury is his immaculate use of the double-cheeked air kiss at gallery openings. Mr. de Pury was standing in the middle of “Guillaume Bruère: Vanilla,” a show at Nahmad Contemporary he curated with his wife Michaela de Pury under the auspices of de Pury de Pury. That’s the private art dealing outfit they formed in 2013 after both leaving Phillips de Pury auction house, where he was the chairman and his wife, formerly a co-owner and head of the Munich auction house Neumeister, was a senior partner. The glow of the man in the Savile Row suit burned at this space on the third floor of 980 Madison. Everyone said hello to Simon. (Everyone always says hello to Simon.) The show is the work of a nobody genius named Guillaume Bruère, who Mr. de Pury discovered some months ago, dragged from the metaphorical gutter and lifted up like an astronaut to the top of New York City, his art like Schiele meets Basquiat in a way that wows and bores in wonderful shifting ratios. Down the hall, at Venus Over Manhattan Gallery, there’s a group show curated by Mr. de Pury, this one called “Fire!,” named such because each piece is kiln-made or glass-blown—believe it or not, it’s a ceramics show. So he’s got the whole floor. When “Fire!” opens tonight, it will make him the de facto mayor of Manhattan’s most major gallery-stuffed edifice. It’s his first public tango on the art world dance floor since leaving a career in the public auction racket, first prominently at Sotheby’s, then his own firm, to just do Simon: lead auctions at private galas from Macau to Monte Carlo, facilitate private sales for ungodly sums, fop around in gorgeous suits on foreign atolls, spin 50 Cent and Puff Daddy and Kanye West as a DJ for hire, Instagram nonstop, hobnob with the best of them, be free of the constraints of auction dates. Ah, the life. As the opening was ending, a starry eyed woman in the throes of adoration, seemingly nearing 90, came up to say hello and said “Oh, Seeee-MON!” as if these words were her last. The former auction house chairman turned from a conversation and—with not a beat missed—mock-kissed the air preciselly 2 inches away from her cheek, mock-kissed the air 2 inches from her other cheek, mock-kissed the air 2 inches from her hand. A week and a half later, Mr. de Pury was sitting with his wife at a zebra-print table in the Mark Hotel’s lobby bar. Mr. de Pury had swapped one of his perfect suits for perfect jeans and a perfect button-down, and though he had just an hour earlier come in from Paris, he could not be more awake, alert, excitable. It was last Sunday night and “Fire!” was to open in 70 hours. The install had yet to get started, and we suggested that perhaps this made Venus Over Manhattan owner Adam Lindemann slightly nervous. This idea, as it happens, would be ceramics. “We thought, let’s don’t show the ‘Next Young Artist’ or whatever,” said Ms. de Pury (immediately after saying this, she realized that next door, at Nahmad Contemporary, they were indeed showing the ‘Next Young Artist’ or whatever). 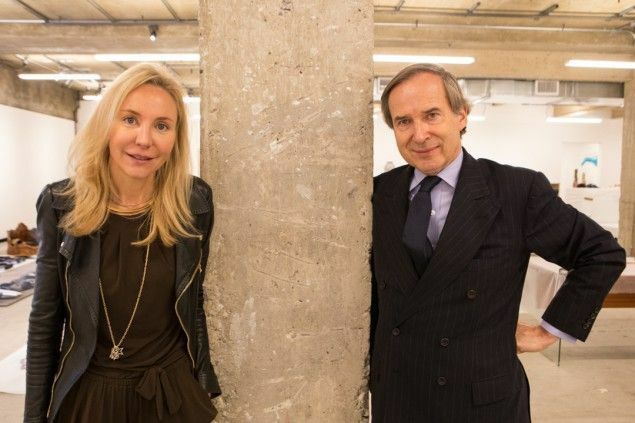 If Mr. de Pury’s right, and we are living in the age of the great ceramics phenomenon, his return to curating will be a one-two punch: at Nahmad Contemporary, all the works sold in a flash, we’re told, at $26,000 each, all for an artist no one had heard of six months ago. “The show could have sold out five times over,” Ms. de Pury said casually. How exactly “Guillaume Bruère: Vanilla” came together is so perfectly Simon the excitable boy, Simon the aesthete, Simon the jetsetter. He was wielding a gavel for a gala in St. Tropez benefitting Leonardo DiCaprio’s charity and he stayed the next day to have tea on a verandah with Joe Nahmad, who —as you may know from openings at Nahmad Contemporary—is close friends with Mr. DiCaprio. Offhand, Mr. de Pury mentioned an artist he had seen at the Van Gogh Foundation in Arles. Guillaume Bruère. Never heard of the kid. He pulled up some snapshots on his iPhone, and Joe said he wanted to go right then the artist’s studio in Berlin. This is in late August. “Joe was able to act really fast,” Mr. de Pury said. “Two days later the work was being shipped.” And the show opened September 3. “Fire!” came together through a more piecemeal process—he would be struck by a ceramics piece by Sterling Ruby in the Whitney Biennial, or discover a young unknown like the glasswork artist Flavie Audi—but it’s clear that regardless of the backstory, de Pury de Pury will be returning to curating at various spots across the globe. But when you’re Simon, to ‘gram is to endorse, and so artists are clamoring for him to throw paintings on his feed (he has 75,000 followers). A picture by some new artist will prompt buyers and gallerists and collectors to text him from all over the world. Once, when he Instagrammed an impressionistic close-up of a random green-and-red-lit bar along his travels, his phone exploded: “Who is this?” “Where can we buy him?” “How much?” He had to explain that the “art” was … really just some restaurant.